This may have been the first elite level tournament of the year for these teams but, wow, did Boston Brute Squad look dominant in their return to play in 2017. With all the preseason hype surrounding the new acquisitions of Seattle Riot, San Francisco Fury, and Denver Molly Brown, Boston walloped the competition with their stifling match-up defense and ruthlessly efficient offense. After giving up 10 to Portland Schwa to open the weekend, Brute locked in and only surrendered 6 more points in pool play before cruising through the bracket with wins over Atlanta Ozone and Fury before running away with the final 13-8. In the third place game, Molly Brown downed Fury 13-11. The expected top four teams in the women’s division held seed and all made the semifinals. Expect to more late tournament matchups between Boston, Seattle, San Francisco, and Denver as the season continues. Washington D.C. Scandal secured fifth with a win over Seattle Underground, who broke seed and upset expectations by taking sixth. For more coverage of the women’s division at the Pro-Elite Challenge, check out our Tournament Recap and scores. Philadelphia Green won their first tournament after rebranding from Green Means Go, besting Quebec Iris in the final of Old Line Classic to complete an undefeated weekend. With a 7-0 weekend, Florida Tabby Rosa easily won Huckfest in Alabama. Going into the season, the only real concern for San Francisco Relvolver was how would a team with so much talent build chemistry and establish roles. They seem to have accomplished that this past weekend. A closer than expected 13-11 pool play win over Portland Rhino — who eventually finished 11th after getting stomped by Michigan High Five in prequarters — posed questions about Revolver’s preparedness but 13-11 and 13-7 wins over Seattle Sockeye and Washington D.C. Truck Stop in the semis and final, respectively, reinforced what we already thought we knew about San Francisco. They’re the best team in the country until someone can prove they can beat them. Defending champion Boston Ironside had a different kind of weekend. 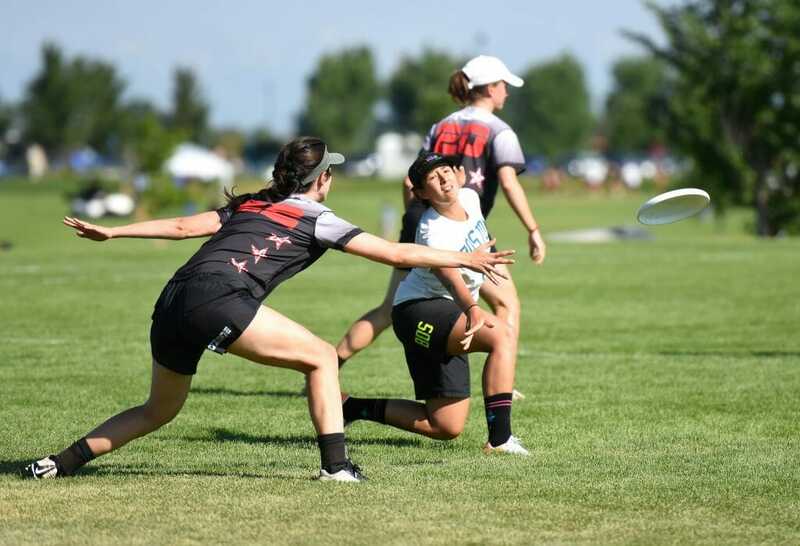 With several key pieces missing, they only squeaked past New York PoNY in pool play before being upset by Truck in the semifinals and falling to Seattle in the third place game. Truck also fended off Seattle in pool play but the Fish responded with a win in the quarterfinals 13-8 over Denver Johnny Bravo. For more coverage of the men’s division at the Pro-Elite Challenge, check out our Tournament Recap and scores. At the first ever Philadelphia Select Classic, Baltimore Medicine Men came out on top of a three-way tie with Cleveland Smokestack and Garden State Ultimate to win the eight-team round robin event. Phoenix Sprawl beat Seattle Voodoo on double game point to win the San Diego Slammer. Huntsville Freaks proved their top-seed billing and emerged unscathed from Huckfest. Orlando Omen was a cut above the rest at Swan Boat taking the round robin 8-0 and defeating second place Tampa Bay UpRoar 11-3. Iowa City Illusion took the Motown Throwdown crown over Chicago Black Market 12-8. Pawtucket Pesterbug took down Needham Deathsquad at AntlerLock in Burlington, VT to finish out their undefeated weekend. After falling to Seattle Mixtape and Philadelphia AMP in pool play, Seattle BFG caught fire and tore through bracket play at the Pro-Elite Challenge. Topping the #2 seed Minneapolis Drag’n Thrust 13-8 in the quarters before holding off AMP in a rematch, BFG then went onto to dominate the final 13-9 over the defending national champions and #1 seed Boston Slow White. Using their depth, wealth of experience, and athleticism, BFG has upturned the Mixed division and is sure to make a splash in the next Power Rankings. With additional TCT stops at the Elite-Select Challenge and Pro Flight Finale, they’ll have ample opportunity to solidify a bid and prove their ceiling to any remaining doubters. San Francisco Blackbird took Pool C over Cincinnati Steamboat, who fell to Mixtape in quarters, but the Bay Area squad could not continue their success into the bracket where they fell to AMP in their quarters game. Slow White continued their recent success over Mixtape in a rematch of the US Open finals from last summer, defeating them in an exciting double game point semifinal clash (video of this game available now in the club team pack and for subscribers). For more coverage of the mixed division at the Pro-Elite Challenge, check out our Tournament Recap and scores. In New Richmond, MN, Minnesota Star Power cruised to the title at Mixed MUDI. Huntsville Method overcame a loss in pool play to beat Athens Murmur in the final at Huckfest. At Motown Throwdown, Columbus Cocktails rolled through competition, going 8-0 to win the tournament. Orlando Swing State overcame similarly named Swag State and the rest of the field to win Swan Boat. Battleship out of St-Jean-sur-Richelieu cruised to an easy win at AntlerLock beating hometown Burlington Heartless twice. The Club season hits a bit of mid-July lull, with very few events on the calendar this weekend. There are officially no sanctioned tournaments scheduled in the Men’s division for July 15-16. Revolution (X/W) is the headline event on the weekend, as 36 West Coast mixed teams descend on Davis, CA. The field includes all four ranked Bay Area squads — Blackbird, Mischief, Polar Bears, and ABBQ — as well as a number of teams sitting just outside the Top 25. In the Women’s division, #24 Oakland LOL looks to prove they deserve to stay in our rankings. While this won’t be the strongest Philly Invite (X) of all time, there are plenty of Select Flight Mid-Atlantic and Northeast teams that will be jostling for position and looking to earn Regionals bids for their Sections. Bourbon Bash (X) in Lexington, KY will host 14 Classic Flight teams from the eastern half of the country. Comments on "Club Update: Brute Squad, Revolver, BFG Earn Pro-Elite Challenge Titles"